Heart strings concerto because after listening about 5 versions of this pieces, I was getting increasingly emotive. I was definitely not sure whether it is melancholy, romantic, anger, triumph or perhaps a combination of them. Perhaps, I would change my will to have this played during my funeral, or over a romantic dinner or perhaps over a deeply philosophical reflective canvass. It did not help that Brahms did little commentary to help in the interpretation except dedicating to great hungarian violinist Joseph Joachim who was introduced to Brahms by another hungarian violinist Eduard Remenyi. Both violinists contributed much to this piece as Brahms was primarily a pianist but it was Joachim that premiered and gained most of the recognition for his contribution. My recommendation for enjoying this wonderful piece is against a dimly lighted room with a glass of full body and long finish french red wine and allow your mind and body to relax. Just in case, I am not an alcoholic. Remenyi was no ordinary person and supported the Hungarian revolution of 1848-1849 and had to leave Hungary as a result. Career wise, though with less limelight than Joachim, he was a notably successful violinist with calling cards that included solo violinist to Queen Victoria. Remenyi was mostly remembered for dropping dead in the midst of giving a concert in San Francisco. Although there is some evidence from various correspondents that Brahms intended it to be a 4 movement piece with a scherzo in between but the final product was a 3 movement piece. As with most Brahms music, there is little guesswork on the authoritative source as Brahms made sure only the final piece remains and discard all of work in progress. The cadenza has about 16 versions exists by musicians like Leopold Auer, Henri Marteau, Max Reger, Fritz Kreisler, Jascha Heifetz, George Enescu, Nigel Kennedy, Rachel Barton Pine and Ruggiero Ricci. On this count, it could be classed as a virtuoso show piece rather than a symphonic work. A symphonic work is most probably more appropriate as it comes with a 90 bar introduction by the orchestra and also a pretty substantial melody line on the oboe in the second movement. When attending a concert of this piece, be prepared to see the solo violinist standing there for a good part of the work. Joan Chissell seems to imply that this concerto was written by Brahms to bridge the quarrel with Joachim for openly siding with Amalie Schneeweiss during her divorce proceedings in 1880. It is more likely for the another Brahms piece Double Concerto opus 102 composed in 1887 as an apology instead. Not exactly sure why Brahms remained single although he claimed that his love for music is too overwhelming to accommodate another love for a wife. However, he seems to be associated with wives of his friend like Clara Schumann in addition to Joachim's divorce. The piece was premiered on 1st January 1879 by Joachim as soloist and Brahms conducting at the Leipzig Gewandhaus. There are two major views on the program for that concert based on historical records. This is not uncommon even in modern day concerts due to no-show or last minute logistical problems for the actual concert to vary with the program. The majority view was the concert went as per the program note with Beethoven Violin Concerto in D opus 61 for the first half and Brahms Violin Concerto also in D major opus 77 for the second half. This was most probably Joachim's idea to have a more familiar piece by Beethoven to pave the way for the new work as Brahms clearly preferred it the other way. The second view held by Charles O'Connell with the concert consisting of Beethoven 7th symphony and and a handful of other minor works. This seems highly unlikely as it would have stretched beyond the normal duration of a concert. My favorite movement is the subdued second movement with the woodwinds dominated introduction that moves my heart string greatly, Another favorite part is the cadenza part of the first movement where the soloist can demonstrate their skills. The third movement provides a contrast to the first 2 movements but I cannot finger it as being celebratory, anger or triumph. 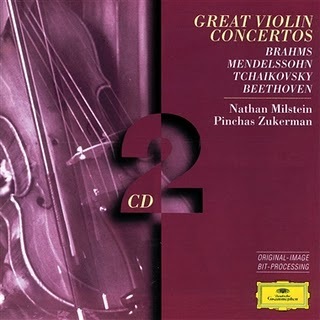 This piece is classed as one of the four great German violin concertos with along those by Beethoven, Mendelssohn and Bruch, it is also recorded by many artists but I would limit it to those I have heard and personally like it. Actually the inclusion of Mendelssohn can be a joke as the name itself is as Jewish as can be but he converted away from Judaism though. 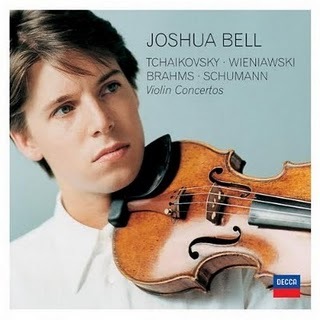 For the more recent recordings, the two pieces that comes to mind are Joshua Bell and Julia Fischer. 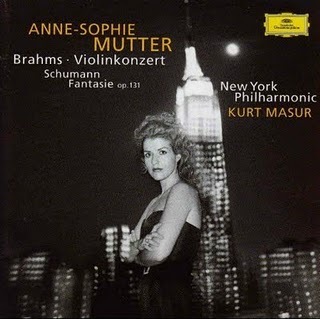 Another recording that has been highly acclaimed is Anne-Sophie Mutter second recording with Kurt Masur in 1997 after the death of her husband in 1995 as one of the more emotive perhaps emitting from her personal grief. 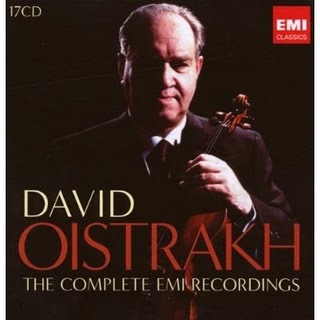 As for the more dated recordings, I like Nathan Milstein second recording with conductor Eugene Jochum and David Oistrakh recording with Pierre Fournier. I understand from literature that Milstein first recording in mono is supposedly one of the best but I cannot comment as I have not heard it.